Text: Origins. Reginald Heber (1783-1826) was an Anglican clergyman who served in England (1807-1823) and India (1823-1826). Heber wished to create a set of hymns that coincided with each Sunday of the liturgical church year. 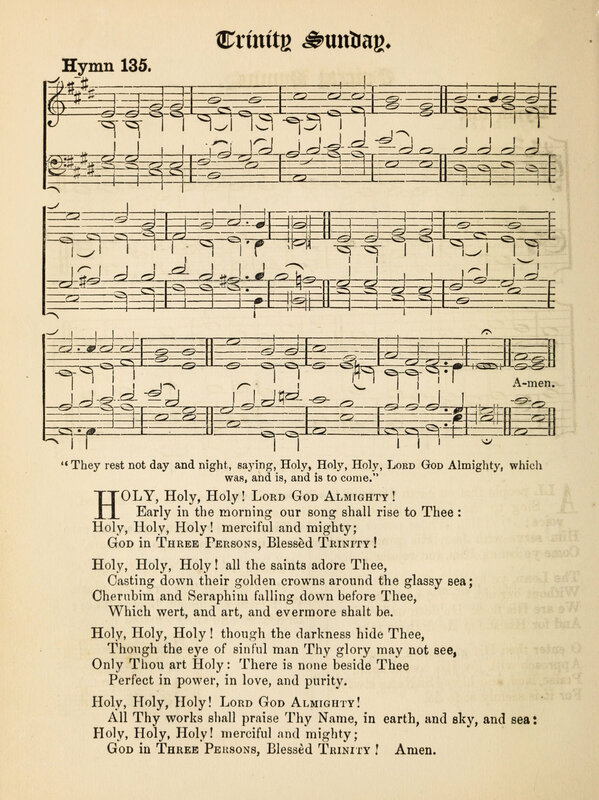 “Holy, holy, holy” was written for Trinity Sunday, the first Sunday after Pentecost, when Heber was Vicar of Hodnet. It is said to have been first printed in the third edition of A Selection of Psalms and Hymns of the Parish Church of Banbury (1826), but this collection is either lost or only exists in private collections. It was included in Heber’s posthumous Hymns Written and Adapted to the Weekly Church Service of the Year (London, 1827 | Fig. 1), without music, in four stanzas of four lines. Fig. 1. Hymns Written and Adapted to the Weekly Church Service of the Year (1827). A manuscript copy of Heber’s Hymns is held in the British Library (Add MS 25704). It includes a small difference at the end of stanza 2, line 4: “and ever art to be” (Fig. 2). The British Library record does not indicate whose hand is responsible for the manuscript; it could be the hand of Amelia Heber, his widow, who prepared the publication of Hymns in 1827. Fig. 2. British Library, Add MS 25704. Text: Analysis. Heber’s hymn draws largely from Revelation 4:1-11, part of John’s heavenly vision of angelic worship, which relates closely to Isaiah’s vision in Isaiah 6. It contains the glorious “Holy, holy, holy,” known throughout history as the kedusha, trisagion, tersanctus (or simply Sanctus), or thrice-holy. One unique feature of Heber’s text is the persistent rhyme of the same sound (y/ee) at the end of all sixteen lines. Although Heber’s text is still often printed without alteration, some versions of the hymn include sensible revisions. The phrase “Early in the morning,” for example, is sometimes changed to reflect usage of the hymn at other hours of the day (or night). The most archaic phrase, “Which wert and art and evermore shalt be,” is frequently subjected to revision. Tune. The tune which is now practically inseparable from Heber’s text, NICAEA, was written by John Bacchus Dykes (1823-1876) for the first edition of Hymns Ancient and Modern (London: Novello, 1861 | Fig. 3). The tune is named after the Council of Nicaea (A.D. 325), which officially affirmed and defined the orthodox doctrine of the Trinity. The opening triad of Dykes’ melody is sometimes seen as a musical homage to the Trinity. Fig. 3. Hymns Ancient & Modern (London: Novello, 1861). NICAEA is sometimes compared to other tunes, especially WACHET AUF by Philipp Nicolai (1556–1608), with its rising triad and other structural features. Hymnologist Carl Daw has noted an important difference: “Unlike Nicolai, Dykes never returns all the way to the tonic at the conclusion of a structural unit and thus is able to keep up the forward motion of his tune.” NICAEA has also been compared to TRINITY by John Hopkins (1820–1891). For a detailed argument of how NICAEA might have been based on the tune ADORATION by Lowell Mason, see Robin A. Leaver, “Dykes’ NICAEA: An original hymn tune, or the re-working of another?” The Hymn, vol. 38, no. 2 (April 1987), pp. 21-24 (HathiTrust). Carl P. Daw Jr. “Holy, holy, holy,” Glory to God: A Companion (Louisville: Westminster John Knox, 2016), p. 2. Erik Routley, “Nicaea,” Companion to Congregational Praise (London: Independent Press, 1953), p. 125. Archibald Jacob, “NICAEA,” Songs of Praise Discussed (Oxford: University Press, 1933), p. 115. “Holy, holy, holy! Lord God Almighty!” Hymns Ancient & Modern, Historical Edition (London: William Clowes & Sons, 1909), pp. 425-426. Percy Dearmer & Archibald Jacob, “Holy holy, holy! Lord God Almighty!” Songs of Praise Discussed (Oxford: University Press, 1933), p. 115. K.L. Parry & Erik Routley, “Holy, holy, holy! Lord God Almighty,” Companion to Congregational Praise (London: Independent Press, 1953), p. 125. Erik Routley, “Holy, holy, holy,” Hymns and the Faith (Greenwich, CT: Seabury Press, 1956), pp. 69-78. Frank Colquhoun, “Holy, holy, holy,” Hymns that Live (Downers Grove, IL: InterVarsity Press, 1980), pp. 146-153. Carol A. Doran & Robin A. Leaver, “Holy, holy, holy! Lord God Almighty,” The Hymnal 1982 Companion, vol. 3A (NY: Church Hymnal Corp., 1994), 667-671. Edward Darling & Donald Davison, “Holy, holy, holy! Lord God Almighty,” Companion to Church Hymnal (Dublin: Columba Press, 2005), pp. 447-449. Paul Westermeyer, “Holy, holy, holy, Lord God Almighty!” Companion to Evangelical Lutheran Worship (Minneapolis: Augsburg Fortress, 2010), pp. 232-234. Carl P. Daw Jr. “Holy, holy, holy,” Glory to God: A Companion (Louisville: Westminster John Knox, 2016), pp. 1-3.